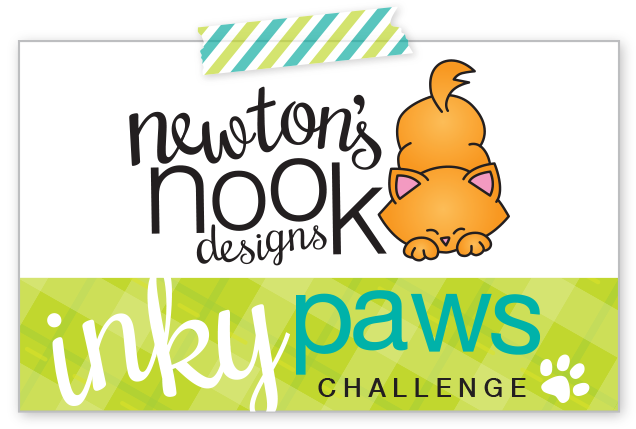 Hello and welcome to Day 3 of the Newton’s Nook Designs August Release! 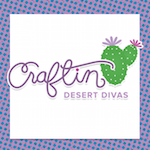 All the new August products will be avaliable for purchaise on Friday, August 18th at Newton’s Nook Designs online store and other craft retailers! 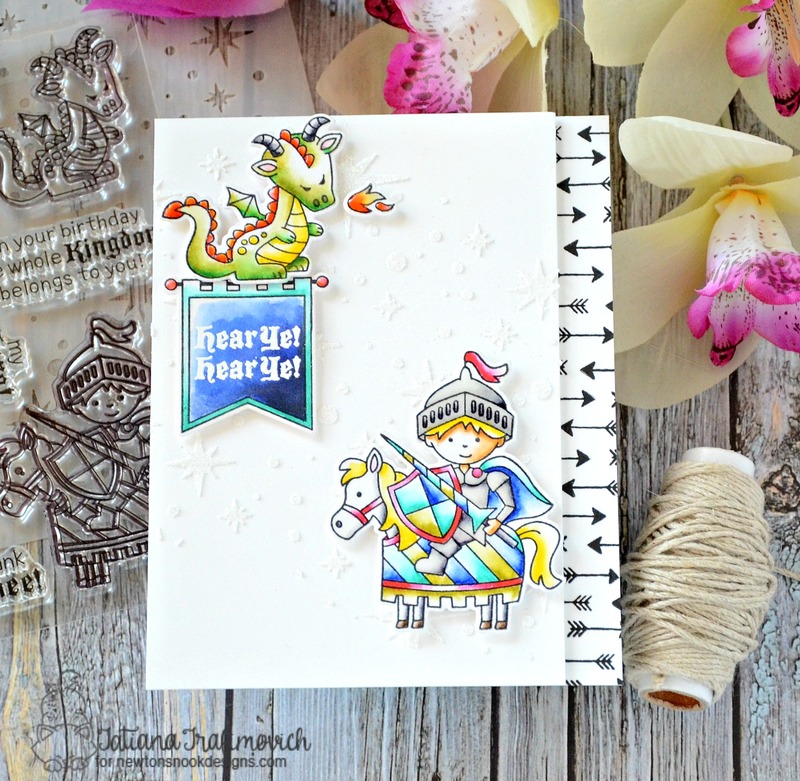 I’m so excited to introduce you today another fabulous stamp set called Knight’s Quest that coordinates perfectly with release just yesterday Once Upon A Princess set. The fabulous stamps from both sets can be easily mixed and matched and give you infinite possibilities to play, creating any kind of paper crafting projects suitable for girls and boys. Knight’s Quest set comes with the coordinating dies. Giveaway alert!! NND is giving this stamp set away to one lucky winner so make sure you read all the way to the bottom of this post to see how to win! A little bit of sparkle added from Starfield Stencil was a must for my card. I used once more the same technique and sprinkled a clear sparkling embossing powder on top of the “fresh” embossing paste once lifted up the stencil, let everything air dry for an hour or so and finally heat set the embossing powder with a heat tool, creating an easy non distractive background for the card. The super cute images were stamped on Strathmore Bristol paper with a waterproof ink since my color choice was on Zig markers. I also created a sort of my own patterned paper by repeatedly stamping the arrow from the same Knight’s Quest set. And I just couldn’t skip some tiny shiny details applying Glossy Accents here and there! 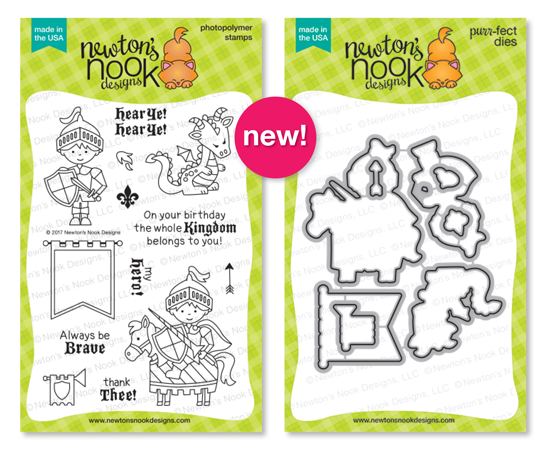 Would you like to win the “Knight’s Quest” Stamp Set? Love this adorable card! 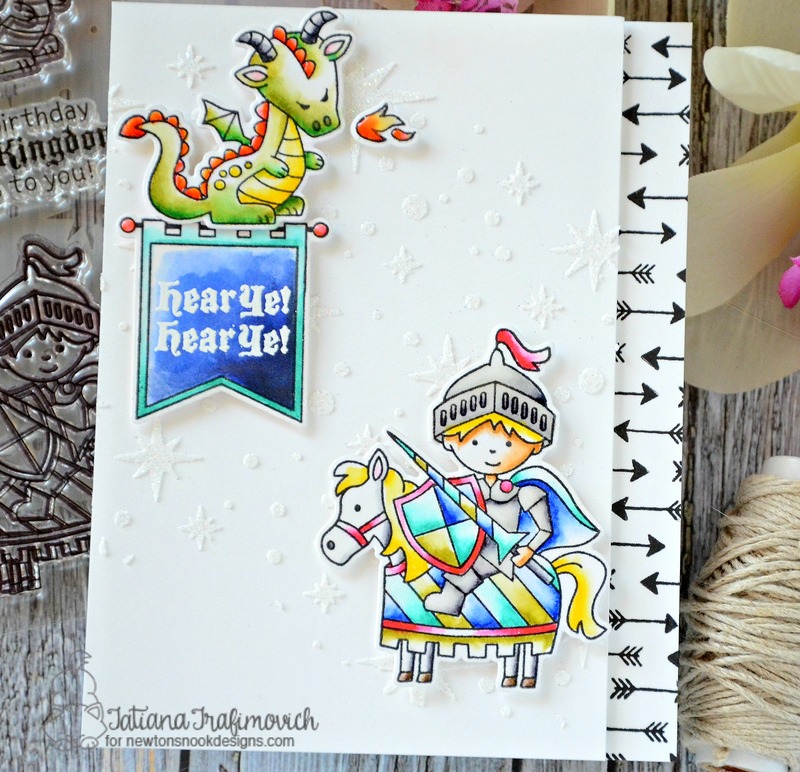 Your background and stamped patterned paper are perfect for your gorgeous coloring of this cute images! 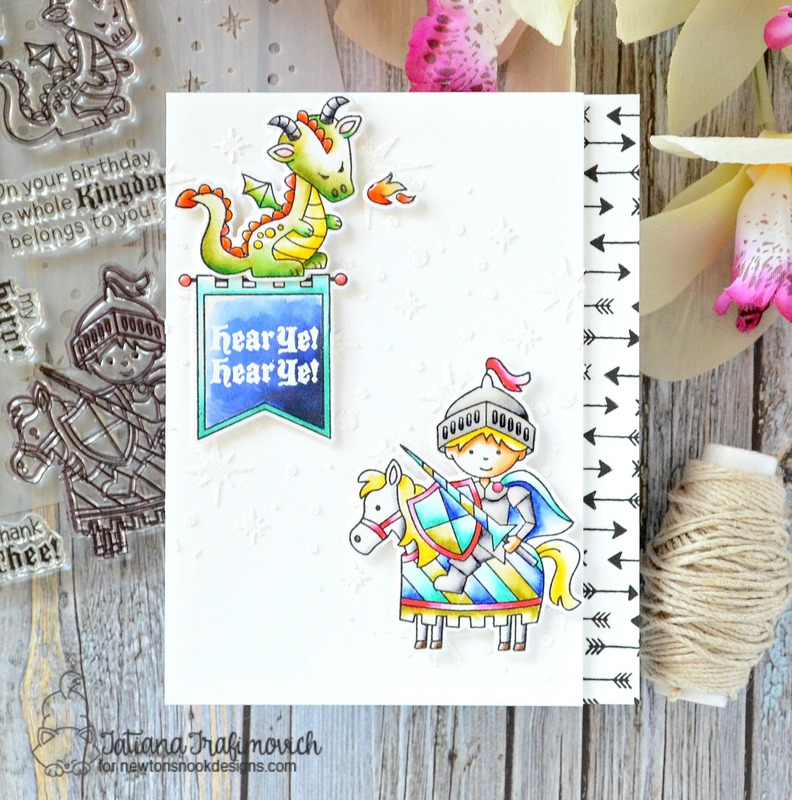 I really like the layout of your card….putting the dragon on top of the “hear ye, hear ye” is perfect!!! This card is fantastic! The sparkly background is perfect. And I just love how you stamped the arrows along the side!!! Super cute card, I love the subtle texture of the white on white! I can’t wait to try using embossing powder with my embossing paste. Thanks for the inspiration! Beautiful job! I love your beautiful bright colors! Amazing! Beautiful card!! I love the repeated stamping for your patten paper!! Awesome job!! I like the sparkly background and the arrow border. LOve your background and the scene with the hot breath of the dragon. Love your coloring with the side panel of arrows! What a fabulous card…love the detail on the image panel.